Dr. Zachary Zeigler said he’s not going to tell “comforting lies” when it comes to weight loss, such as removing gluten or carbs from your diet will solve everything. 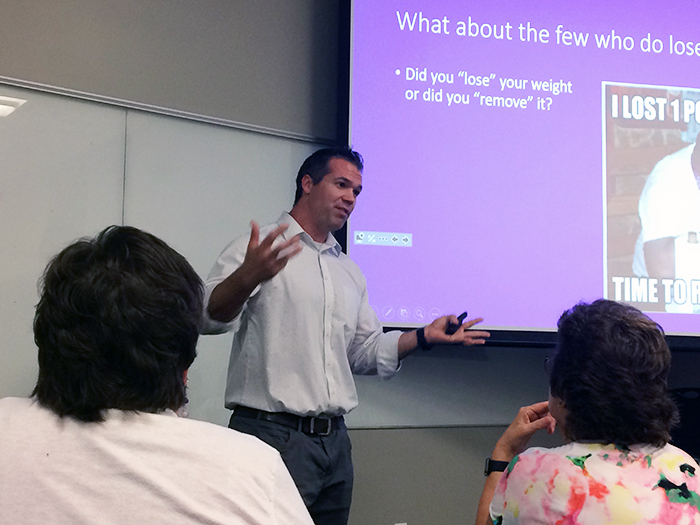 In his talk Wednesday, he discussed what we’re doing wrong when it comes to weight loss. Everyone in the entire galaxy wants to lose weight. If you doubt it, ponder these statistics, from a 2003-08 national survey of almost 17,000 Americans: 73 percent of women and 55 percent of men said they wanted to lose weight, and 50 percent of women and 30 percent of men actually made some weight-loss efforts the previous year. Not to dash your hopes, and just in case you wanted to hear something woeful, here it is (if you didn’t want to hear anything woeful, sorry): “Most persons will not stay in treatment for obesity. Of those who stay in treatment, most will not lose weight, and of those who do lose weight, most will regain it,” according to “Pain of Obesity” author Dr. Albert J. Stunkard. 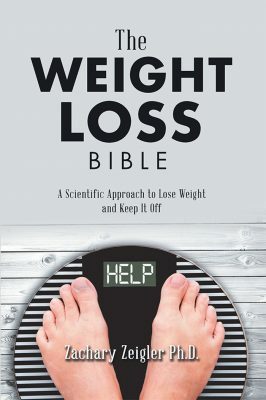 Zeigler’s new book “The Weight Loss Bible” takes a more holistic approach to weight loss. Zeigler said something most of us know but don’t want to admit – we haven’t been successful at losing weight over the long term. You have to look at, not just dieting and exercise, but sleep, stress, the number of meals you eat per day and what time of day you eat those meals. You have to take a holistic approach. In his talk, Zeigler discussed what isn’t working, such as blaming the victim. He pointed to a landmark study by Claude Bouchard in which he isolated sets of identical twins, placing them in a research facility for 100 days and controlling their diet and exercise. Dietitians prepared and brought them their meals. The subjects were made to exercise and burn 1,000 calories every nine out of 10 days – average workouts burn about 300 to 500 calories, Zeigler said. Doing the math, the subjects should have lost about 27 pounds, or 12 kilograms. One set of twins lost about 8 kilograms each, but another set lost only 1 to 2 kilograms each. “Now some people lost weight, but a lot didn’t, so we have got to get away from just thinking, ‘Oh, just exercise, you’ll lose weight. It’s that simple.’ That’s total baloney. For certain people, maybe you’ve got this genetic predisposition. … We act like it’s so simple, but it’s not,” Zeigler said. He pointed out something else that isn’t working for those who want to lose weight. In an analysis published in 2007 called “Weight Loss Outcomes,” researchers followed 26,000 subjects in 80 studies. About a third quit their respective studies. Of those who did complete the study, regardless of the method of weight loss, peak weight loss was at six months. Average weight loss over four years was 3 to 4 percent of their initial body weight. Zeigler said when the average woman wants to lose 32 percent of her weight, a measly three to four percent weight loss is a failure in most people’s minds. 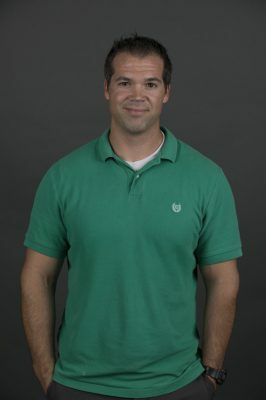 Zeigler looked at what many see as the most successful form of weight loss – bariatric surgery. Canadian researchers followed a group of post-bariatric patients for an average of 11 years. Zeigler said many of us spend a lifetime losing and then regaining weight, over and over again – something called weight cycling, or yo-yo dieting. Some researchers, such as Zeigler, say weight cycling is bad. Others say it’s benign. One 2006 study, called “Weight Cycling of Athletes and Subsequent Weight Gain in Middle Age,” looked at more than 1,100 male athletes who had represented Finland in the Olympics. Some competed in sports that required them to meet a weight class and so were classified as weight cyclers, others didn’t meet that requirement, and still others were included as a control group. The study was started when the athletes were in their 20s and ended when they were 65. Athletes classified as weight cyclers gained more weight over their lifespan. Zeigler said an abundance of research shows weight cycling is associated with such conditions as cardiovascular disease, possibly because of increased blood pressure, as well as bone loss and breast cancer. “The area of the strongest body of literature is what weight cycling does to our body fat distribution,” he said. Constantly losing and regaining weight, he said, could change your fat distribution. Zeigler and colleagues at Arizona State University, where he received his doctoral degree, wanted to find out if weight cycling affects arterial stiffness (and high blood pressure). One more thing that might be another hope-dasher for some people: Weight loss might not be as important as we think it is in the scope of overall health. In every population study he has looked at, he said it’s better to be fat and fit than underweight and unfit. He took into account liposuction research in 2004 that looked at patients who had abdominal liposuction surgery and then maintained their normal daily routines for 12 weeks. Looking at the health outcomes, the researchers didn’t see a difference in LDL cholesterol, HDL cholesterol, triglycerides, glucose and blood pressure. Just removing the fat didn’t do anything, Zeigler said. “Maybe being a little fluffy, if you’re eating right, you’re exercising, maybe that’s not that big of a deal,” Zeigler said. You can reach GCU Today senior writer Lana Sweeten-Shults at 602-639-7901 or at lana.sweeten-shults@gcu.edu. Follow her on Twitter @LanaSweetenShul. Fascinating article. I always saw myself as the overweight healthy person. Carrying about 25 pounds more then I should but still active, eating a relatively healthy diet and blood work always coming up just above normal. The only problem I have with the theory that weight loss may not be necessary, is the temptation for those looking for a way out, to dismiss the need for a lifestyle change. I started a “lifestyle” change (not a diet) 2 yrs ago. The main change, eating better and less. Two years later, I am down 38 pounds. So I agree, losing weight shouldn’t be the end all be all, but rather a lifestyle change. And that change or changes can and will be different for many. Then let each person’s body see where those changes take them. Because I know the changes I made, may not produce the same results for everyone. May your article give hope to those who need to change without discouraging, while not excusing those looking for a reason not to.